The origins of this sweet treat are believed to be English in spite of the French name. 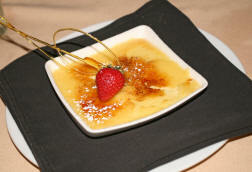 Although the English referred to this mouth watering custard as "burnt cream," the name Crème Brûlee just sounds so much more delicious? 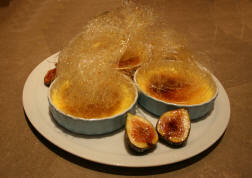 The origins of this dish are a bit hazy, but Trinity College in Cambridge claims the honor. Francois Massialot's cookbook which came out in 1691 refers to Trinity Cream or Cambridge Burnt Cream where a version of Crème Brûlee was served with the college arms branded into the cream top. Firefly in Panama Beach, Florida serves a yummy White Chocolate Crème Brûlee. Chef Paul Stellato has served presidents, President Obama, Bill Clinton and Al Gore, and royalty, Queen Elizabeth and Prince Phillip. When the Obama family made a short visit several years ago, Firefly was their choice for a Saturday night family dinner. Chef Paul Stellato served a tuna appetizer and a course of fried oysters to the First Family. For dinner, Michelle Obama had lobster, Sasha had Pasta Alfredo and the President had a New York Strip and Shrimp. For dessert, the First Family enjoyed that delicious White Chocolate Crème Brûlee. When it comes to presentation, the prettiest Crème Bruelee was a Tahitian Vanilla Bean Crème Brûlee at Cotton Row in Huntsville, Alabama. It was also a very delicious Crème Brûlee. Located on the southwest corner of the Courthouse Square, the three-story brick Cotton Row Restaurant was built in 1821 in the Cotton Exchange District. The restaurant featuring fine American cuisine with strong Southern influences. James Boyce is the executive chef/owner. 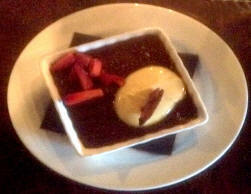 Mesquite Chop House in Southhaven, Mississippi offers a Godiva White Chocolate Creme Brûlee to die for. Chef Jeremy Jaggers, graduate of the L'Ecole Culinaire, is the captain of this culinary ship and guides her well. As the name implies, all the steaks and chops are grilled over an open mesquite fire. The decor is comfortable with lots of exposed beams and a fireplace that would be cozy in winter. Music is offered several nights a week. Everything I tried was delicious. Staff was friendly and helpful. Tic Toc Room in Macon, Georgia was not always the upscale restaurant it is today. In the 1950s, it was called Anne's Tic Toc Room where a young singer worked as a dishwasher. Occasionally he got to sing there. Annie and the patrons then never guessed that Little Richard would move on to become one of the biggest musicians of Rock and Roll. Today, the Tic Toc Room is one of Macon's top dining spots. Their Crème Brûlee is wonderful. It's creamy with a crispy top. The food ranges from sushi to steak to seafood. A house specialty is their fancy martinis in different styles and colors. House Wine & Bistro in McAllen, Texas has a really unique version, Earl Grey Brûlee with a lavender sugar crust. Chef Larry Delgado and his wife, Jessica, opened House Wine & Bistro in 2008 and did so well he recently opened a second restaurant, Salt, also in McAllen. Chef Larry is a great all around chef. Not only are his desserts fantastic, he won second place in the Great American Seafood Cook-Off in New Orleans in 2014. (See more about this) That is really a hard prize to bring home.